every step of its development. We've compiled a quick overview of the most common myths you are likely to encounter while shopping for a diamond simulant. 4 Take the Asha� Challenge! 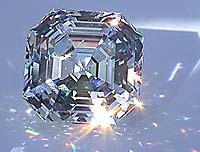 Asha� is the only diamond simulant in the world that employs a patent pending form of amorphous diamond. 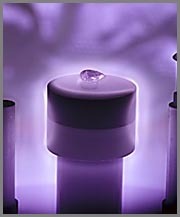 These microscopic diamond crystals are blasted into the Asha� crystal through the Amorphous Diamond Treatment (ADT) process to give Asha� an upper layer that is both simulant and man-made diamond crystal. Hearts and Arrows is an industry term for a specific type of round cut where all facets are in perfect alignment, proportion and symmetry. 4 Read the appraisal for an Asha� H&A Round Cut. 4 Read a more scientific article discussing Asha�. What does an expert on fancy cut diamonds think about the Asha� princess cut? You can learn more about our stunning beauty, Asha� Princess cut. 4 Read the appraisal for an Asha� Princess Cut. After some extensive research, as well as our in-house testing, we will now be rhodium plating all of our Asha� white-gold jewelry, at our cost. 4 Setting Guide 4 Stone Size Comparison! 4 Asha� Care & Cleaning Guide 4 Questions? 4 Read our customers' feedback.